The OmniFlex AutoVac is an automated high performance floor cleaning machine that cleans and is fast as a traditional walk-behind or ride-on autoscrubber – at a fraction of the cost! A really simple approach to cleaner, safer floors, this system is perfect for high speed cleaning of hard surface areas, such as hallways, cafeterias, lobbies, warehouses, fitness areas and more. It’s as fast and effective as an autoscrubber without the added cost or complexity, making it perfect for building service contractors and facility managers alike. As daytime cleaning becomes more widespread in commercial environments, the RBV 130 makes it easy to maintain offices and common areas alike with minimal disruption. The RBV 130 features a noise level of only 45 dBa, a 1.5-gallon tank and a 250-watt motor with runtime of 45 minutes ensure sufficient operational capacity and power. The 36-volt lithium ion battery may be interchanged with a canister unit and charged for 2.5 hours. At only 16 pounds, the RBV 130 is compact and light enough for anyone to use comfortably. With patented ribs on the inside of the tank to ensure maximum suction regardless of how full the bag is, the RBV 130 always gives you top performance. The PVR 200 (Henry) and PVR 380, from NACECARE Solutions, set the industry standard for excellence in commercial vacuum equipment. That's because they've been completely re-designed, with their best features enhanced to be better than ever. Both machines still have a powerful 1.6 hP vacuum motor providing 110" of lift and 114 CFM for excellent soil recovery and longer carpet life. The new AUTOSAVE feature automatically starts the vacuum motor on low speed, reducing power consumption by 50% while only reducing suction by 25%. Additionally, the switch is now located conveniently on the front of the vacuum for easier operation. When equipped with a HEPA-Flo Bag, standard filtration is 0.3 micron at 99.97% efficiency. Both models are equipped with a thermal overload for long-term motor protection and operator safety, and the rewind head conveniently stores the 3' power cord internally to prevent power cord damage from improper wrapping. 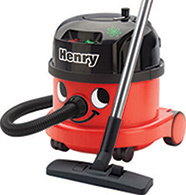 Meet Henry (and his friends Charles, James and many more) who are part of a line of commercial vacuums from Nacecare, the market leader in green vacuums. They look friendly with their happy faces on front of the canisters but they mean business. The "guys" can be found everywhere — from hotel suites to jumbo jets. That's because these vacuums always work. Henry holds nearly 2-1/2 gallons of dirt, which means less time changing the bag. Although it's always hungry, Henry is an energy saver with a low energy mode, which is especially good with curtains and soft furnishings. The Henry Micro has a Microtex four-stage filtrations system that helps allergy sufferers. 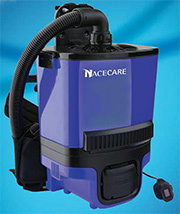 Nacecare has been offering powerful and revolutionary cleaning solutions since 1985 with the all-purpose Henry to leading maintenance-free gel battery technology to the revolutionary Powertec High Pressure Unit. Click here for specs. CleanMax Cadet Vacuums by Tacony Corporation feature a Clean Air System design for fan protection, motor protection and HEPA filtration to capture 99.97% of airborne particles. Plus, Quick Draw on-board tools put the vacuum's powerful suction right at your finger tips for above floor cleaning. These vacuums glide over the carpet for speedy one pass cleaning. The Cadet vacuums carry the "Silver Rating" from The Carpet and Rug Institute, and are tested and approved for soil removal, dust containment and appearance retention. Dirt-laden air is filtered through a micron filter bag and secondary filter before passing through the fan and motor. CleanMax vacuums are built to withstand the rigors of commercial cleaning with all the features that matter on the job. Click here for specs.